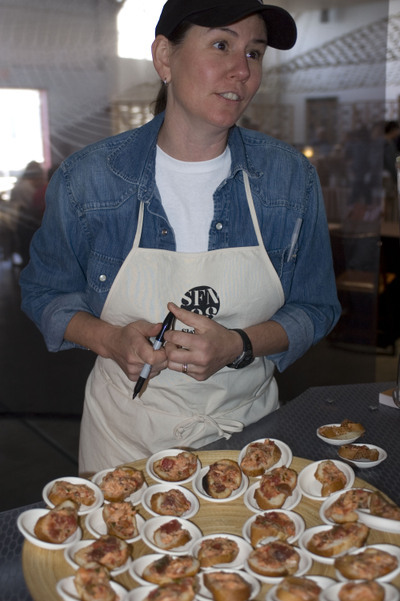 I told you I was headed to Slow Food Nation '08 in San Francisco and it was definitely a great time and experience. While there were shocking logistical issues (I'm used to NY efficiency!!) the overall point is that I discovered some fantastic new food items which should help inspire me to create many great recipes in the future. And, since the Slow Food tagline is "Good. Clean. Fair." 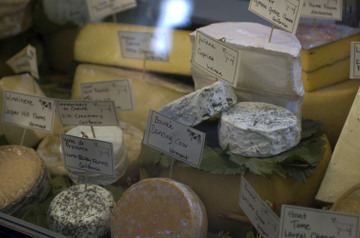 it's also food that is produced or harvested with a conscience and a love for artisanal processes and motivations. (i.e. love vs. $$) While there, I talked to such a variety of vendors and producers that blew me away with their knowledge and passion about their unique food stuff. I hadn't realized how badly I wanted to meet highly competent people and listen to them geek out about their coffee, cheeses, charcuterie, fish, wine, chocolate, olive oil, honey, pickles and more. It was fun and wildly educational, inspiring and a great adventure. Believe it or not, you CAN learn a lot about olive oil by speaking with growers and drinking 12 samples from little plastic shot glasses. 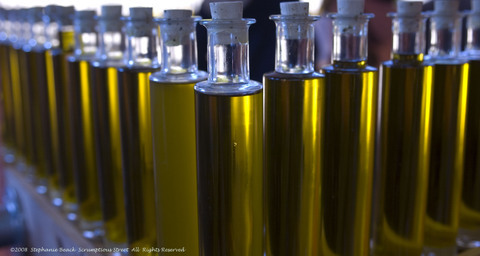 When asked by a fellow-taster why the oils were so much better than the ones you can buy in a grocery store, the simple and honest answer of "Because they're not rancid like the ones in supermarkets", made all the sense in the world and gave us all the opportunity to share an understanding chuckle as well. 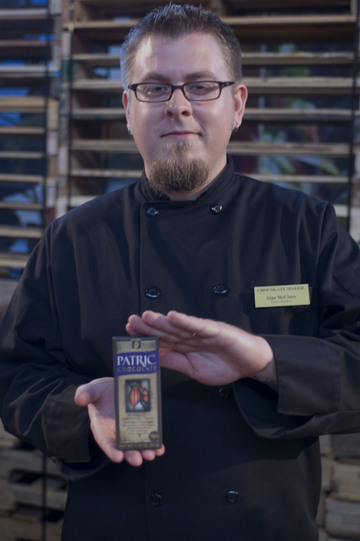 My ultimate Favorite Discovery, what I considered the "Best in Show" was Patric Chocolate from Columbia, MO. The chef/owner, Alan McClure is a man who is possessed with a fire for exquisite-tasting chocolate from the purest possible ingredients. Like many things, the more you simplify something, the better it is and the more opportunity the basic ingredients come to life with their own vibrancy and complexity. Patric Chocolate's 70% Cacao "Madagascar Sambirano Valley Micro-Batch Dark Chocolate" boggled my mind and my tastebuds. Mr. McClure's chocolate is so unique and pure and it contains just two ingredients: cocoa beans and sugar. There is no soy lecithin, no cocoa butter and other flavorings, artificial or otherwise. I have never tasted chocolate this essential and wow, have I been missing out. 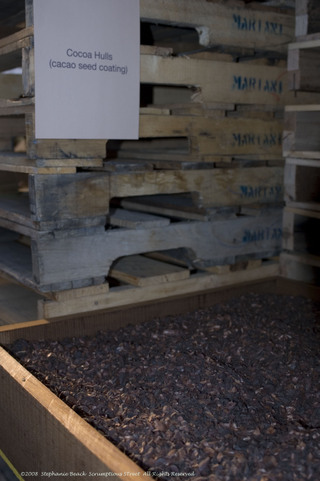 In the purest of ingredients and the most technical and precise processing, Patric Chocolate exhibits as much terroir rendered properties as any fine wine or coffee. I could taste citrus, red wine, and berries (blackberry and boysenberry in particular) in one small nibble of chocolate melted between my tongue and the roof of my mouth. Of course, they weren't selling at the show but I ordered some online and it just arrived. Packaged in a box and sealed inside were the chocolate bars, surrounded by coolant gel and insulated foam. So the chocolate stayed below 78˚F and wouldn't break in transit. How's that for love? I cannot wait to create something spectacular and share it with all of you. After Mr. Scrumptious and I check that my efforts are worth the chocolate, of course. Next up, was some great honey from Mockingbird Meadows in Marysville, OH. Not only is the original quality and taste of their honey fantastic, but they create infusions which load the honey with delightful, unique and interesting flavors. They are herbalists, chemists and foodies as well as bee keepers and honey producers. Some variations that were terrific included Walnut Honey as well as Ginger, Lemon and Garlic Honey. 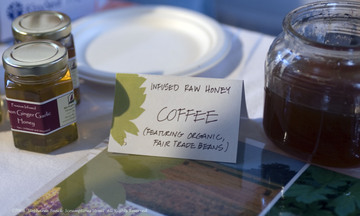 But, my absolute favorite-- nearly dropped my camera it was soo good-- was the Coffee-infused Honey. Just like it sounds, the beans were steeped in the honey for one month, just long enough to impart a subtle but very definite coffee flavor and to enhance the fruitiness and floral notes of both the beans and the honey. To use these items, you will need a great culinary imagination. Or, follow the recipes of someone with one. ;-) Stay tuned!! I've got several planned when my order comes in. The last thing I tried that was so unique I need to tell you about it is a cucumber-flavored vodka from Square One. I do enjoy good vodka and so I couldn't walk away from one that wasn't the typical artificial citrus, berry, or pepper flavors. 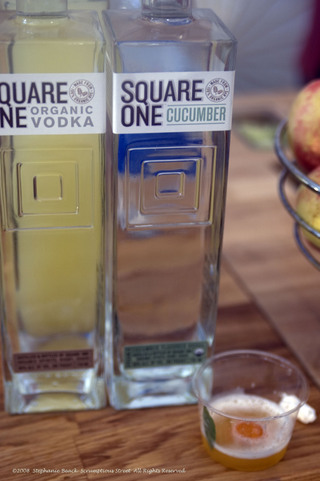 Square One's plain unflavored vodka was so smooth and round that it tasted more like a very good sake or shochu than vodka. But, the cucumber-flavored vodka really was incredible. Light, fresh, crisp and honestly tasting like a natural organic ripe and freshly-picked cucumber, I think it will make a fantastic base for many dishes as well as cocktails. They served a sample of the vodka with some freshly-squeezed heirloom tomato water, a tiny pinch of sea salt and a tiny basil leaf. It tasted exactly like a gazpacho cocktail and I will definitely have a party where I serve these while the weather is still nice. You've got to try this stuff! Cheese, incredible and responsible fish from CleanFish, Inc. (their Arctic Char was some of the best I've ever had!! ), olive oil, charcuterie, ice cream, gelato... so many other things were there and all of them were delicious, organic and micro-created instead of mass-produced. Here are just a few more images showing what was on offer. As the event progresses around the world, I encourage everyone who can attend one to make every effort to do so. Keep an eye on Slow Food USA's site, for events next year and beyond.